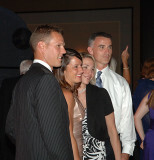 Here are some images from the 8th Annual 2009 Camp Good Days Gala at the Hyatt Regency Buffalo held on June 20th. This was the 30th Anniversary of Camp so it was an extra special celebration. The Star Wars theme was a blast, so enjoy the pics. This is my 16th year volunteering with Camp and we all appreciate everyone's support through the years. Here is a little bit of info about Camp and our web address for more details. Camp Good Days is a celebration of life, with those who appreciate it the most…a place where courage knows no boundaries! www.CampGoodDays.org for more information on how you can help too! Looks like a great time,hope to go next year.